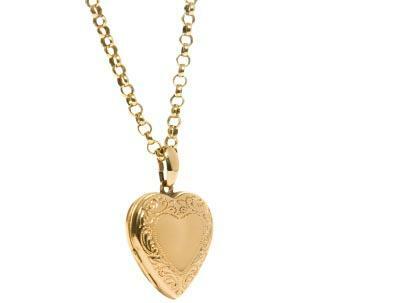 14K gold photo engraved lockets come in many styles for locket collectors. They make a classic gift for mothers, grandmothers and sweethearts who want to wear an image of a loved one in a fashionable piece of jewelry. For years, a locket usually referred to a pendant that could hold a miniature painting or photographs in one or more compartments. Today's locket innovations also include jewelry with photos imprinted directly onto the jewel's surface. This type of jewelry is often referred to as photo engraved, picture jewelry or photo jewelry. How does a jeweler attach a photo to a piece of jewelry? Jewelers most commonly laser engrave a photo onto the jewelry surface with a machine in a process that makes the photo imprint both scratch-proof and water-proof. They also sometimes use a photo enameling process to print photos onto metal jewelry. Some jewelry artists also create handcrafted altered art photo lockets and attach a photo entirely by hand in an artistic design onto the gold pendant with a strong adhesive like two-part epoxy. They then cover the image with a finish to prevent yellowing and protect it from scratches. Many jewelers who offer personalized photo jewelry are also willing to engrave initials or a short phrase onto the locket. 14K gold photo engraved lockets come in simple, elegant designs as well as more elaborate styles with accessory gemstones. Simple designs often rely on the photo as the central decoration for the jewelry. Fancier styles include decorative accessories like additional engravings or gemstones. The photo lockets often resemble open pendants, rather than traditional hinged compartment lockets. This is because many do not have compartments, since these are not needed to hold photographs. Pictures on Gold: Pictures on Gold provides a large selection of 14K yellow or white gold photo lockets. They offer the laser engraving of photos in color or black and white. The site sells lockets that can feature laser photo engravings or hold traditional photographs in the compartments. They also have single-sided pendants with photo engravings on the face. PhotoScribe: This site offers dozens of locket options, including oval, square and heart-shaped lockets. If you prefer, the company can remove the background in your photo for a cleaner image. Personalized Boutique: The Personalized Boutique uses a photo enameling process to create 14K yellow gold or white gold photo jewelry. Lockets and pendants styles are available. Photo engraved lockets are sturdier than traditional lockets since the engraved image is generally scratch resistant and can't curl at the edges or yellow like photographs. However, proper jewelry care is still important to keep the locket looking as good as new for years to come. Store the locket in a jewelry box when not in use. Take the jewelry off when playing rough sports where it could catch on things. Remove the locket when doing chores involving harsh household chemicals that could splash on it. Whenever the locket seems like it needs cleaning, simply wipe it with a jeweler's polishing cloth or a gentle dry cloth. If it needs deeper cleaning, wet a soft cloth with a soap and water solution and wash away any debris. Use a second cloth to rinse away the soap with clear water. Carefully dry the locket and allow it to dry out in the open before returning it to a jewelry box. Gentle care of your gold locket will allow it to last for years to come.